When you are in the car you are there to race and to win! You don't want to spend your time thinking about strategy, or what your last lap time was. This is another area where the Z1 Dashboard can help you. The Z1 Dashboard has various ways to alert you to important information. The Z1 Dashboard can speak various pieces of information upon request. 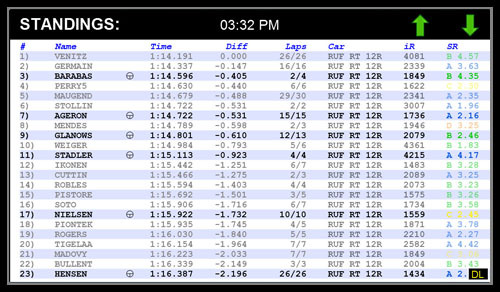 These include lap times, sector times, deltas, position, fuel usage and more. 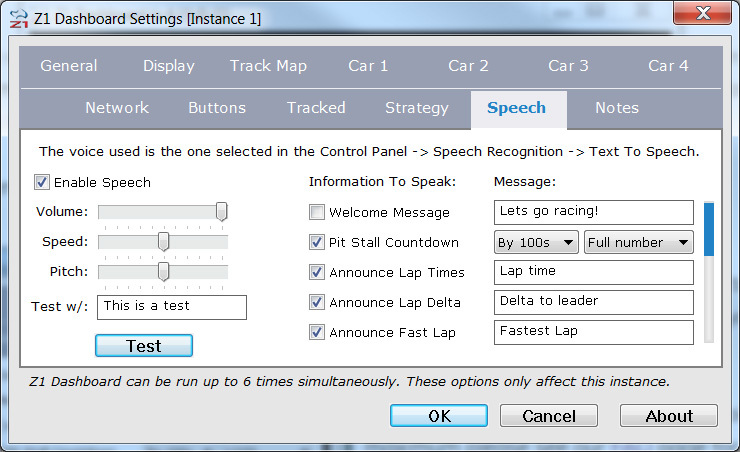 This information can be requested every time you finish a lap or a sector, or when you press a button on your wheel or button box. Your position on the track relative to your competitors is vital. The Z1 Dashboard can tell you if you are losing or gaining time to the driver ahead or behind. It can show you where the other drivers are on track. 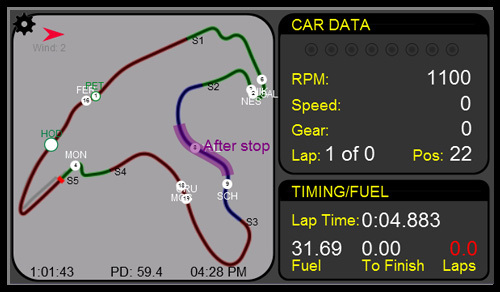 More importantly when you near your pit stop it can show you the pit stop delta overlayed on the track map. This gives you the information you need to decide when to pit. You'll know when you can pit and come out ahead of your competitors! When you are nearing a pit stop the drivers you are racing may not be the ones near you on track because they may have pitted already. The Z1 Dashboard will track these drivers and highlight them for you on the track map allowing you to see where you are in relationship with them. This is extremely useful to help you decide when you should pit. The current weather conditions on track are important to know. The Z1 Dashboard's weather dash shows you all available information in a single location. From cloud cover, to track temperature, to wind speed and direction everything you need to know is there in a single glance. 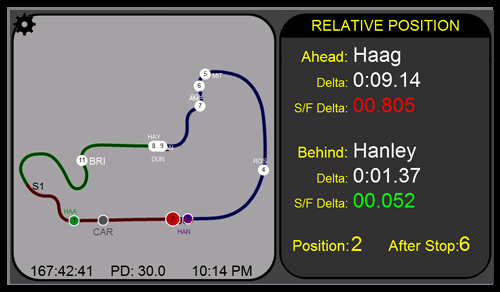 All track maps have wind speed and direction overlays. 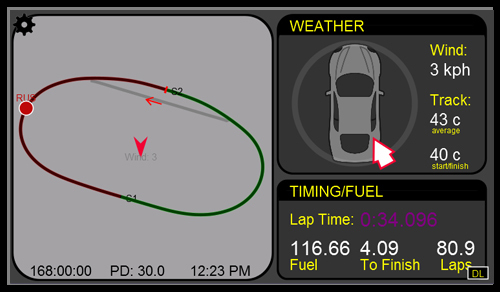 Track Map 6 even has a wind direction compass showing you the relative direction of the wind compared to your car's current direction. That along with the current wind speed and temperatures help you drive the car more effectively at all points on the track. Knowing how fast you are compared to the competition is important. The standings dashboard, available both in and out of the car, shows the full list of drivers along with their lap times, deltas, laps driven, car type and whether they are on track or not. If you are using iRacing then you can also see each driver's iRating and safety rating.